Pinellas commissioners have reached an agreement with their new county administrator. Barry Burton, an administrator for a county north of Chicago, will start work in Pinellas Oct. 29. Burton takes over for Mark Woodard, who has worked for Pinellas County for 30 years. Burton's last day as the administrator in Lake County, Ill. will be Oct. 24, according to his spokeswoman. "I'm looking forward to it," Pinellas County Commission Chairman Ken Welch said about Burton coming to Pinellas. "I'm looking forward to a smooth transition." 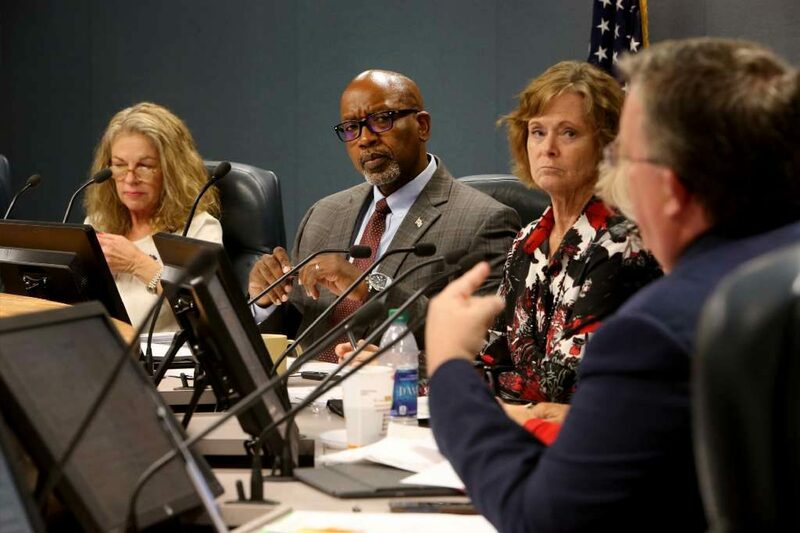 Once arriving in the Sunshine State, Burton will have to work to repair bruised relations with several commissioners after he requested a salary package of $302,000, which they considered too much. Commissioners rejected the request and nearly pulled Burton's job offer on Aug. 29. They voted 4-2 to offer Burton a base pay of $267,500 and another $22,200 for deferred compensation and a car allowance. He watched online from Illinois and negotiated through text messages and a call with Welch. Burton's employment contract requires him to become a Pinellas County resident by Nov. 29. Taxpayers will pay up to $24,000 in housing expenses over 12 months. The perk will end as soon as he sells his Illinois home. Other perks include up to $18,000 in moving expenses and $3,000 to cover expenses for Burton to search for a home in the county. He will also collect at one-time payment of $1,800 for healthcare until he is covered under the county's insurance plan. After a nationwide search, Burton was the top choice of all seven commissioners when they tallied rankings in a July workshop. Forty-five individuals applied for the position. The commissioners praised Burton, who applied for the same position years ago. He didn't make the final cut then because he lacked experience working in a major county, commissioners said. The administrator oversees about 2,000 employees and a budget of $2.2 billion. Woodard became administrator in 2014 after commissioners fired Bob LaSala, who had drawn criticism for a management style that his bosses said contributed to employee turnover and high-profile disputes. Woodard quickly won praise for repairing fractured relationships with city and community partners across the county. Married to former Tampa Mayor Pam Iorio, Woodard joined the county in 1988 as a senior management financial analyst and served as director of the Office of Management and Budget from 1994 until 2001. He then became an assistant county administrator. In recent months as commissioners searched for a replacement, municipal leaders praised Woodard for the way he created partnerships to solve problems. As a longtime public employee, Woodard did not want an employment contract, car allowance or any other benefit that other employees couldn’t receive. Welch said Woodard's departure will be difficult, and it will take time for Burton to master all that Woodard has done for the county. "Mark Woodard is a tremendously tough act to follow," Welch said. "He had a unique approach to the job. This is going to take awhile for anybody to match."